A man was attacked n a Ballymena hostel following a discussion about “who was Protestant and who was Catholic,” a court has heard. A prosecutor told Ballymena Magistrates Court a man was punched in the face by both of the defendants at the Simon Community hostel in Harryville on September 9. Simon Anthony McDonagh (33), and Neil Henry (22), whose addresses were both given as the hostel at Henry Street, pleaded guilty to assaulting a man. And McDonagh also admitted assaulting two police officers and causing criminal damage to a police cell on the same date. They were each jailed for four months. The prosecutor said McDonagh, who had 105 convictions, had to be restrained in a police cell and spat on the face of a police officer and on the neck of another as well as spitting all around the cell which had to be cleaned. The prosecutor said that during a police interview Henry said they had been drinking in a room at the hostel and started to talk about “who was Protestant and who was Catholic”. He said McDonagh punched the victim on a bed several times. McDonagh told police he had thrown a bag of cannabis, which he alleged belonged to the injured party, out a window because he “doesn’t agree with drugs”. He claimed he didn’t intend to spit on the police officers but a prosecutor said police believed it was deliberate. A defence lawyer for Henry said the two men had spent two months in custody on the charges and said there was no “sectarian motive” regarding his client. Deputy District Judge Philip Mateer said there was no evidence from the injured party that he was assaulted because of religion, otherwise it would be a “hate crime”. McDonagh’s defence lawyer said his client’s behaviour was “abhorrent” and he said the defendant regretted his actions. He said McDonagh had only been released the day before the incident on High Court bail. He said a disagreement regarding religion “turned bad” but said the incident was not a “hate crime”. 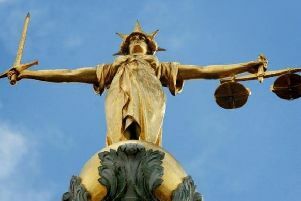 The judge said there seemed to be no obvious reason why the men lashed out and punched the injured man. He said the incident happened in a hostel which should have been a “sanctuary”.